The client bought the site when it was occupied by a redundant and derelict public house/nightclub and initiated a brief which required a design for a new multi-storey office block. The site was very narrow and outline planning approval prevented windows facing onto Ferensway so that potential future development on land adjacent to the site wouldn’t be restricted. The new building is of contemporary design providing 18,000 sq.ft. 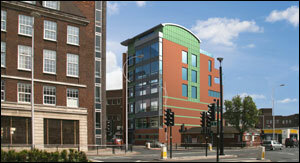 of high quality office space over 7 storeys and ground floor parking. Image Data Group, a hugely successful printing company based in the East Riding, required a printing unit which had good transport links with the rest of the country, and consequently bought plot 2 at the Ozone in Howden. The building consisted of a large 61,400 sq.ft. space that was split into two distinct areas; one for the printing equipment and the other a storage/packaging area. In addition to the printing area there was 4,800 sq.ft. of office space, which was extended again in 2011 as a result of continued growth. The client purchased a redundant, overgrown site in a prime location on the Humber Estuary overlooking Lincolnshire and beyond in order to construct a new office building for his company, and provide premises for commercial rent. The new contemporary building has large areas of glazing to maximise views over the Estuary and blue glazed bricks, polished blocks and zinc cladding create a modern, high quality 24,000 sq.ft. structure over four floors.